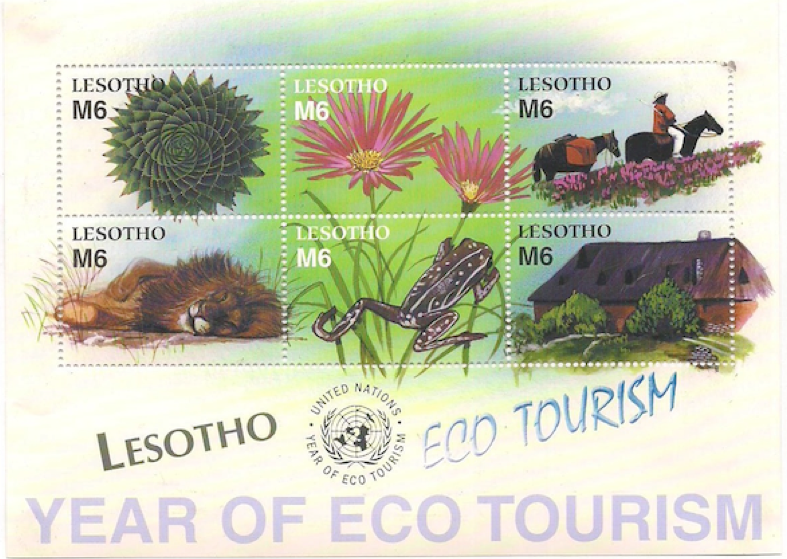 When Lesotho issued some postage stamps to mark the United Nations Year of Eco-Tourism, we felt deeply honoured because a picture of the main house of Morija Guest Houses was chosen to be made into one of the six special stamps! See photo on right. the guest houses are built with local materials: sandstone, trees from the nearby woodlot and thatching grass. The cottages below the main house are smeared with a mixture of mud and cow dung according to the traditional method. the houses all blend perfectly in their surroundings. rubbish is disposed of as ecologically as possible: all kitchen refuse is fed to neighbours' pigs or goats, paper and cardboard are kept for burning in the wood stove and fireplaces in winter, and all glass bottles, plastic bottles and aluminium tins are taken to the recycler's. Therefore only a minimum of rubbish is burnt in deep pits that are then covered up. we do not offer small amenities in rooms/bathrooms to avoid wasteful packaging. Instead the biodegradable hand soap and shower gel we offer are in refillable containers. solar power is partially used in all houses, either for lighting or for hot water. However we are also connected to mains electricity to ensure that there is always a good supply of hot water and that guests can enjoy all modern conveniences. all our staff are from Morija and many of them are close neighbours. a number of neighbours get water from our borehole thanks to the tap next to the main house in order to save women and children a long walk to the village tap. we grow some vegetables and herbs and we also buy as many vegetables as we can from several neighbours' gardens, especially in summer. We buy all our eggs locally from a farmer. we work closely with the Morija Museum and Archives - a pioneer in heritage management and education in Lesotho. we encourage guests to take guides when going on hikes, thus giving extra income to many. we often buy crafts from local people and then sell them to guests. horse rides are offered through a neighbour who acts as a guide and works hand in hand with local horse owners. The money received from the rides goes straight to the guide and the horse owners. young neighbours have made up small groups to perform traditional dances to visitors from which they get some much-appreciated pocket money. the local church youth choir often sings for delighted visitors and uses the money thus received to travel to and participate in choir competitions. in 2010, we created a small Centre for the youth of our hamlet in one of the buildings on our site. It has two rooms, one of which is a quiet place to do homework, with a long desk, a computer (plus a heater in winter) and a small library. In the other room, the youngsters can charge their phones, play games, listen to music, etc. Once a week movies are shown and there's a soccer team linked to the youth centre. Thanks to the young foreign volunteers who run it, the Centre also gives the local youth a chance to practise their English and to get exposed to different cultures while realising the value of their own culture. Donations of books, stationery, posters, etc are accepted gratefully. For details, activities, and photos, see www.facebook.com/hamatelayouth.